Setting up a school counseling office can be a daunting task, especially for new school counselors. I am providing you with a series of tips to help you set up your new school counseling office or revamp the space that you already have. When you are planning the layout for your school counseling office think of all of the things you want students to be able to do in your office. Thinking about what students will be doing in your office will help you plan out your space. I have run many, many groups in my time as a school counselor. When configuring my school counseling space making room for groups was always my top priority. 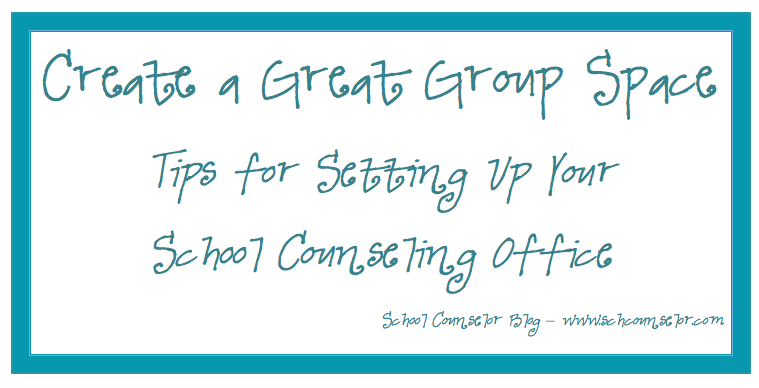 Below are my recommendations for creating a great group counseling space in your school counseling office. I will highlight the group spaces I have had over the years and show you how I used the above tips and give you some additional tips along the way. In my most recent office I did not have very much space at all for groups. I had to get crafty about how I would fit students in my office to host a group. I found a table that could seat six students. I designated this space below for my group counseling sessions. Towards the end of the year I actually changed the orientation of this table... so that the end of the table was against the wall with the windows. Moving the table around seemed to provide more space. I used additional folding chairs and my desk chair for more seating. I prominently displayed my expectations for my office (located beside the "Feeling Puzzled?" 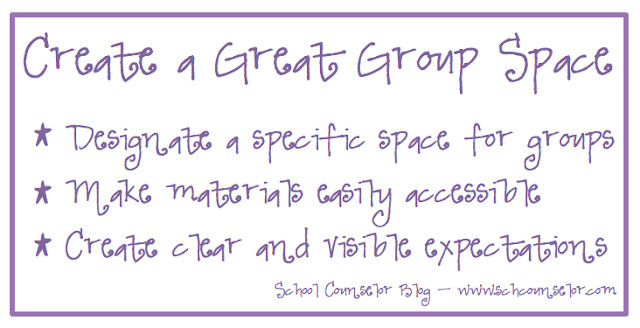 bulletin board) by creating a "Group Rules" banner. 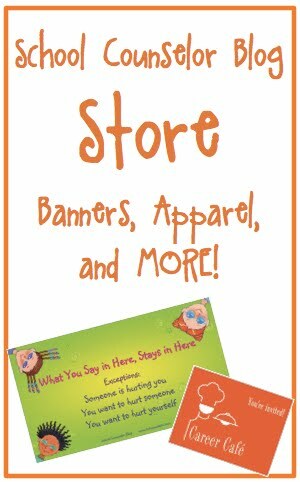 You can create a banner like this one using VistaPrint or order one in the School Counselor Blog Store. The location of this table allowed students to easily access materials and supplies that we used during group. In the picture to the left you can see that behind the green chair students could access rolling storage containers and my stackable storage containers containing art supplies and paper. They also had easy access behind them to puppets, books, drums, and other items we frequently used in groups. Other supplies group materials and supplies were located near the door. I stored additional books and materials stored in my wooden storage cubbies. I stored my inflatable dice and beach balls in a green plastic container near my desk. You can see these items in the picture on the right. My 2010-2011 School Counseling office was a school counselor's dream come true. It was a small classroom so I had tons of space do do everything I could possibly want... including host a whole class! When I first moved into this office there were no tables only desks. I requested two U-shaped tables so I could create one large group table in the middle of the room to create a designated group counseling space. Running groups in this space was an amazing experience. There was enough room to host larger groups of students. I would sometimes split classrooms up and do lessons with half the classroom or do specific lessons for girls and specific lessons for boys. I did a series of three lessons on "boy" bullying and "girl" bullying with 5th grade that went really well. The kids liked being split up and invited with more 5th graders than just their own classroom. In this space books, materials, and art supplies were easily accesible to students. My group expectations were prominently displayed and visible to students from the group counseling space. I have also had my Kid Draw Emotions Bulletin Board Set visible from the group table in all of my school counseling offices. Having examples of emotions visibly displayed helped students come up with feeling words during group activities. My first school counseling office of my very own was a small windowless room. It was very cramped in my office, but I was determined to create a designated space to facilitate counseling groups. I requested a U-shaped table... it practically took up my whole office... but I was so excited because I had space to host a group. It is very hard to see, but I wrote group expectations on construction paper. I displayed the group expectations to the right of the white board where students could easily see and refer to the expectations. 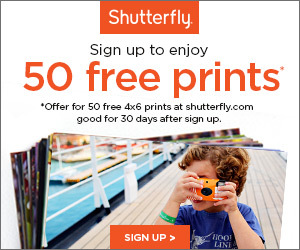 (Obviously this was before I was VistaPrint savvy...). I also had my Kid Draw Emotions Bulletin Board Set visible from the group table. 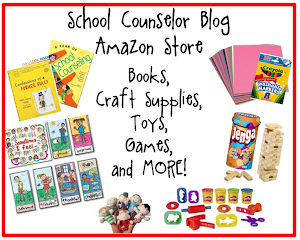 Where to you facilitate school counseling groups? How do you create a great group counseling space in your school counseling office? 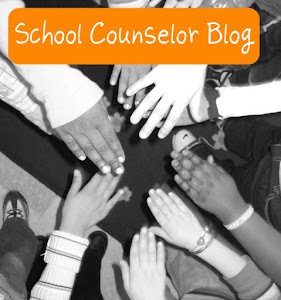 This is the fourth post in a series of Tips for Your School Counseling Office.